Oh, how long it has been since I knitted anything? It has been months, at least. I really wanted to start a pair of travelling socks. You know, the easy-peasy mindless pair you start so you have something in your purse that doesn’t require a pattern. The only thing is that I have five or six pairs of socks and a pair of gloves on the needles that require rigorously following a pattern, or turning a heel, or picking up rows to finish. There aren’t any unused sets of needles in the right size for another pair of anything. Sometimes when I haven’t knitted in a while, I don’t feel like working at it. It needs to be easy. So there hasn’t been any knitting in a while. Lazy girl (that’s me!) just hasn’t been in the mood. Monday was a Federal holiday, thanks to the illustrious Dr. King. Normally I would spend my day off either catching up on DVR’d entertainment or cleaning house. However, we just changed cable companies so there wasn’t any TV to catch up on; and I needed to be in one room to keep my oldest son focused on his reading for school. In the interest of being stationary and productive, I hit the box full of abandoned projects and found a Faire Isle patterned hat that has been languishing since about February 2010 less than halfway completed. Now, some people are intimidated by color work, though I don’t know why. Sure it has a lot of color changes, but I find the work seems to go faster because it keeps my interest. 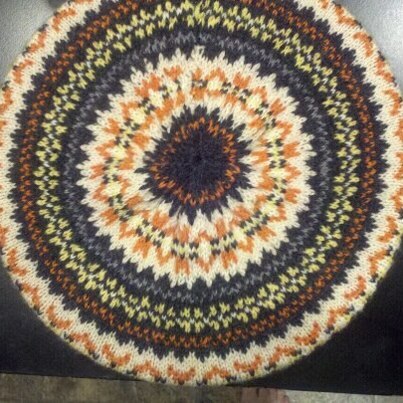 I always want to do just one more row to finish a pattern, or start the next color. In two hours, I had finished knitting. One hour later, I had sewn it up and woven in all the ends. Here it is. Isn’t it lovely? I finally finished something. Whoo hoo! There’s only one problem. I still don’t have a project-free set of sock needles. I wonder what else is in that box?